Scott Thompson fishing and shooting on Lake Tahoe. Photographed with a Motorola Droid. Last summer, my wife and I decided to spend a few hundred bucks and buy a tandem sit on top kayak for the family. The purchase was supposed to be about family fun and fishing, it has held me, my wife, my son, and my 85 pound Labrador all at once. "The Orange Peel", it's nickname, has been well worth the money. But I have also found it to be an incredible addition to my camera bag. The kayak is an Equinox 160T from Costco. The price was way below anything else I had been looking at online. My expectations weren't very high but I have found it to be perfect for my needs. Very stable and a whole lot of space for family and/or camera gear. The front seat has held my big fully loaded camera bag in a large dry bag and I've even stood up in the kayak for photos. (Note: Dry bags are a MUST if you plan on bringing a camera you value onto small paddle driven boat, drips happen, many many drips, oh, and don't forget splashes and sloshes. A small towel is also recommended.) The kayak comes stock with a small covered hatch that keeps things relatively dry but water has unexpectedly gotten in there when the family was using it for play. If you own this kayak, don't trust the hatch for H2O sensitive camera gear. Also, don't plan on winning any kayak races with this beast, slow and steady wins for photography purposes. I've customized my kayak a bit. Online I found two flush mount fishing pole holders and a 4" hatch to provide a little more entertainment value and access to the large interior of the boat creating more storage. These inexpensive additions have been priceless. Trolling for fish on the way to photography locations is a great way to make good use of work hours. Scott's son Kane kayaking and fishing on Donner Lake. When I'm with the whole family, wife and dog included, I skip all cameras but my cell phone. When fishing with just my son, I bring just one camera body, one lens, flash, and polarizing filter. As always a dry bag is a must but I skip the tripod and additional gear. Space is limited and my attention to photography is also limited. But when I'm by myself, this kayak provides plenty of space for all my outdoor gear, 2 Canon bodies, 4 lenses, flash, tripod, and a whole lot of random accessories I rarely need until I don't have them. I own three dry bags of different sizes and I use the smallest I can get away with. The low angle you get when you shoot from a kayak can be a good and a bad thing. It can provide some incredible photogenic angles but the glare and/or reflections on the water requires a polarizing filter most of the time to remove the glare. When you use a polarizer filter you lose a lot of light (kind of like sunglasses for your lens) so shooting from the boat handheld can be a bit more of a challenge. I usually use an ISO of 400 and a shutter speed no slower then 1/160 of a second. Later in the day when more gasoline powered boats get out and about, the waves can really pick up. This can require even faster shutter speeds. It can also require you to ditch the shoot and quickly toss your gear into your dry bag. Safety of camera gear first, I can swim. Lake Tahoe has 71 miles of incredible shoreline but much of it is inaccessible by foot due to private property or rough/steep terrain. Although I haven't kayaked all 71 miles, I have accessed a whole lot of areas I could never have dreamed to get to without it. Getting in close and bumping rocks is no problem either like it would be on most other watercraft. Quickly beaching it in rocky areas and setting up the tripod for a shot has been great as well. Photographed from a kayak with a polarizer filter. Canadian Goose and fog photographed from a kayak. If you are a photographer or just want to get a better look at mother nature, I would highly recommend purchasing a kayak. After much use, the Equinox 160T gets two thumbs up from me. Kayaking is green and good exercise as well. Please enjoy this sideshow of images that I have photographed from my kayak or from shore line that I kayaked to. Click the full screen icon for a better view. Are you a kayaker? 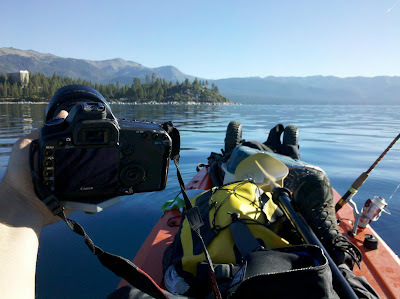 Please comment and/or post a link to a favorite kayak photo of you or that you have shot, or a favorite kayak photo story. Have a question about one of the images, ask me. These images in the slideshow above of Lake Tahoe, Donner Lake and Prosser Reservoir were all photographed from my kayak or from shoreline that I kayaked to. All are available as large fine art prints, gift items, and as stock photography.